First Aid in the Workplace Answers to the most frequently asked questions Who is OSHA and what do they have to say about the necessity of first aid kits in the workplace? • OSHA, the Occupational Safety and Health Administration is a division of the United States Department of Labor, and is charged with enforcing the Occupational Safety and Health Act. The ‘Act’ requires first aid supplies be readily available for employees while on the job. Specifically, #29 CFR, 1910.151(b) says: “In the absence of an infirmary, clinic, or hospital in near proximity to the workplace which is used for the treatment of all injured employees, a person or persons shall be adequately trained to render first aid. Adequate first aid supplies shall be readily available.” Additionally, OSHA says: “First aid supplies are required to be readily available under paragraph § 1910.151(b). An example of the minimal contents of a generic first aid kit is described in American National Standard (ANSI) Z308.1 ‘Minimum Requirements for Workplace First-aid Kits.’ The contents of the kit listed in the ANSI standard should be adequate for small work-sites. When larger operations or multiple operations are being conducted at the same location, employers should determine the need for additional first aid kits at the work-site, additional types of first aid equipment and supplies and additional quantities and types of supplies and equipment in the first aid kits.” What is ‘Near Proximity”? 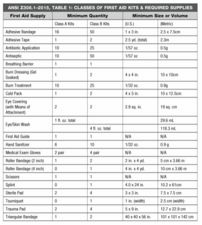 What are the minimum requirements for workplace first aid kits? How do I know if I need a CLASS A kit or a CLASS B kit? • The newest ANSI standard introduces two classes of first aid kits: CLASS A and CLASS B. CLASS A kits are designed to deal with the most common types of workplace injuries. CLASS B kits are designed with a broader range and quantity of supplies to deal with injuries in more complex or high-risk environments. • General warehouse and office locations most likely will fall under the CLASS A standard. • Manufacturing, Construction, Processing plants, or any facility that has an elevated risk of serious injury will fall under the CLASS B standard. Why are there 4 different kit container types in ANSI Z308.1-2015? • The kit containers are classified by portability, ability to be mounted, resistance to water, and corrosion and impact resistance. Four types are identified: a) Type I: Intended for use in stationary, indoor applications where kit contents have minimal potential for damage due to environmental factors and rough handling. These kits are not intended to be portable and should have a means for mounting in a fixed position. Some applications for Type I first aid kits are general indoor use, office use or use in a manufacturing facility. First aid cabinets would generally fall into this type. b) Type II: Intended for use in portable indoor applications where the potential for damage due to environmental factors and rough handling is minimal. These kits should be equipped with a carrying handle. Some applications for Type II first aid kits are general indoor use, or use in office or manufacturing environments. c) Type III: Intended for portable use in mobile indoor and/or outdoor settings where the potential for damage due to environmental factors is not probable. Kits should have the means to be mounted and have a water resistant seal. Typical applications include general indoor use and sheltered outdoor use. d) Type IV: Intended for portable use in mobile industries and/or outdoor applications where the potential for damage due to environmental factors and rough handling is significant. Typical applications include the transportation industry, utility industry, construction industry and the armed forces. Besides complying with OSHA requirements, are there any compelling reasons to have a workplace first aid kit? • Minor day-to-day accidents, injuries and employee discomforts play a major role in reducing productivity. By furnishing first aid and employee comfort items, the employer provides a means for employees to deal with the problem and quickly get back to productive and effective work. Additionally, studies have repeatedly shown that those employees who are suffering from the effects of employee discomforts (headache, upset stomach, cough, sore throat etc;) or pain from a minor accident or injury are more likely to be involved in more serious and possibly catastrophic accidents. Employers find that a well stocked first aid kit ultimately improves employee morale, minimizes down time, improves workplace productivity and reduces workers compensation claims, while at the same time satisfying OSHA requirements. Also, the first aid kit is often the first stop a compliance officer will make when inspecting a facility. A well-stocked first aid kit that is designed to treat multiple injuries can show that your facility is concerned about keeping workers safe and your facility in compliance. A first aid kit that is not stocked, has expired product, or not organized can send a signal to the inspection officer that there may be other compliance issues they need to be on the lookout for. Where should workplace first aid kits be located ? • First aid supplies must be readily available. This is generally considered to mean every floor in every building and separate kits for clean room, food manufacturing and/or food preparation areas. Employees should not have to travel more than 100 feet to secure adequate supplies. Can workplace first aid kits be locked for security purposes? • The readily available requirement makes locking a kit impractical. Back up supplies can be locked up, but the primary supply of appropriate and necessary supplies must be ‘readily available’, which means not having to search for a supervisor with a key. What kind of training is required for my employees? • Per OSHA letter of interpretation: “Training of individuals in first aid in the United States as carried out through a variety of mechanisms. The American Red Cross, through its many local chapters, offers standard and Advanced First Aid courses. The National Safety Council provides educational materials to train individuals in basic first aid knowledge and skills. Private training programs also exist to train people in first aid. It is hoped that this guideline will help establish the essentials of training programs that should be considered in fulfilling OSHA First Aid requirements. GENERAL COMPONENTS OF A FIRST AID TRAINING PROGRAM A. Trainees should develop “hands on” skills through the use of manikins and trainee partners during their training. B. Trainees should be exposed to acute injury and acute illness settings as well as the appropriate response to those settings through the use of visual aids, such as videotape and slides. C. Training should include a course workbook that discusses first aid principles and first aid responses to settings that require first aid interventions. D. Assessment of successful completion of the first aid training program should include instructor observed demonstration of acquired skills and written performance assessments. E. Training duration should allow enough time for particular emphasis on first aid situations likely encountered in particular workplaces. F. Basic Adult Cardiopulmonary Resuscitation training should be included in the first aid training program. G. Periodic review and demonstration of first aid skills and knowledge should be done at least as frequently as every three years. 1) The use of universal precautions for infectious diseases such as HIV and Hepatitis B. 2) A copy of the OSHA standard for blood borne pathogens or information on how to obtain a copy. 3) The meaning of universal precautions, which body fluid are considered potentially infectious, and which are regarded as hazardous. 4) The necessity of keeping gloves readily available and the appropriate use of gloves and other protective equipment. 5) The appropriate disposal of any sharp items or instruments or other items requiring special disposal measures such as blood stained material. 1) Bandaging of the head, chest, shoulder, arm, leg, wrist, elbow, foot, ankle, fingers, toes, and knee. 2) Splinting of the arm, elbow, clavicle, fingers, hand, forearm, ribs, hip, femur, lower leg, ankle, knee, foot, and toes. 3) Moving and rescuing victims including one and two person lifts, ankle and shoulder pulls, and the blanket pull. Why do I have to discard an eye wash bottle even when it’s not completely empty? • The Food and Drug Administration (FDA) requires a warning label be affixed to all eye wash bottles: “Do not use if safety seal is broken or missing”. Since the eye is the most porous membrane in the body, and most germs enter the body through the eyes coupled with the fact that we only get one set of eyes, it doesn’t pay to take chances. Sterility is only assured until the bottle is opened and cross contamination could easily occur on subsequent applications. Product tampering is also a concern. Are kits necessary for company vehicles? • In order to insure ready availability of first aid supplies to all employees while on the job, company vehicles must include first aid kits. The employees company provided work vehicle is literally their “workplace” and is subject to OSHA regulations just as a facility would be. Obviously the variety and quantity of supplies included will be less substantial than an office or shop kit. On vehicles licensed for interstate commerce, a rubber dust gasket is required for protection of the supplies from the elements. What’s the story on ‘Bloodborne Pathogens’? Does the typical business need to worry about compliance? 2. Employees who are designated first aid responders If through the normal course of an employees job function he or she could reasonably be expected to come into contact with potentially infectious bodily fluids (blood, urine, vomit, etc;), compliance with the Bloodborne Pathogens Standard is required. Are SDS’s necessary for the products in a workplace first aid kit? • First aid items provided for employees personal consumption while on the job are considered drugs or cosmetics and as such are subject to Federal Food, Drug and Cosmetic Act compliance. Items subject to regulation under this Act are not regulated as a chemical substance under the Toxic Substances Control Act as specifically stated in 15 USC 2602 (2) (B) (vi). In plain English: SDS’s are not required for first aid items provided for employee’s personal use while on the job. Most first aid manufacturers will however provide SDS’s for first aid items upon request. Are employers liable for potential incidents involving Over-The-Counter medications in a first aid kit? • ANSI says: “Any additional over-the-counter drug product included in a first aid kit should be packaged in a single dose, tamper evident, packaging with full labeling as required by FDA regulations, and should contain no ingredients which are known to cause drowsiness.” If an employer complies with this standard and does not prescribe or dispense OTC medications to adult employees, then there is no liability. Liability becomes a concern when an employer (or agent of the employer) evaluates a patients symptoms and recommends a particular OTC medication for symptom relief (prescribing), or physically delivers or administers the medication (dispensing). Making OTC’s available at no cost to adult employees in a fashion consistent with the ANSI standard eliminates employer liability. What’s the real story on eye wash stations? Are they mandatory?